International architectural firms and Russian officials are to change the appearance of major Russian cities. This summer in 40 cities across the country - from Kaliningrad to Vladivostok - work will begin on renovating streets, parks, squares and embankments. The concept for improving Russian cities has been developed by the Strelka design studio, which is behind the massive improvements witnessed in Moscow since 2014. Internationally renowned architectural firms such as DPZ, Topotek 1, West 8, Snohetta, karres+brands, OKRA, DROM and others are also involved in the scheduled landscaping and other improvements. Foreign experts, architects and officials will work jointly under the auspices of Strelka. The project will be carried out as part of a special federal program of the Agency for Housing Mortgage Lending. "In all, about 7,200 specialists, including 250 international and national experts, as well as 760 regional experts, are included in the project," Konstantin Lavrov, a spokesman for Strelka, told RBTH. Lavrov said that urban improvement is long overdue in Russia, adding that a comfortable city environment not only makes people feel better but also increases the economic potential of a place. 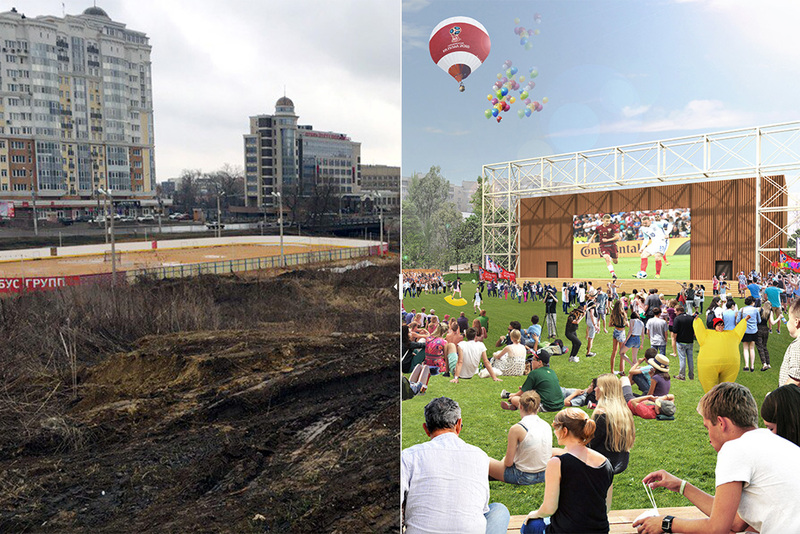 RBTH selects the most incredible examples of this transformation of Russian cities. The embankment in Vladivostok (5,600 miles east of Moscow), which is currently just asphalted, will be converted to two levels: The first will be paved and the lower level, which has access to the water, will get wooden decking and deckchairs. The city embankment in Belgorod (360 miles south of Moscow) currently consists of several unconnected parts, but architects plan to turn it into a single pedestrian zone. Three bridges - including two new crossings and one renovated - will span the Iset River in the center of Yekaterinburg (1,090 miles east of Moscow). On the embankment there will be a pier for staging performances, an observation platform and an amphitheater where festivals and concerts can be held. The capital of the Chechen Republic, Grozny (1,120 miles south of Moscow), which was laid waste during two wars during the 1990s, is now being rebuilt at a record pace. Architects from Strelka hope that this summer a new generation public space will appear in the city. In the capital of the westernmost region of Russia, Kaliningrad (795 miles west of Moscow), Nizhneye Lake, one of the most popular promenades in the city, will be renovated. The renovation of the nearby Verkhneye Lake started in 2012. In Nizhniy Park in Lipetsk (290 miles south of Moscow) an open-air cinema is to be built. Under plans for improving the Nizhniy and Verkhniy city gardens in the center of Ryazan (125 miles east of Moscow), a cinema will be built in a park that, in pre-revolutionary Russia, was part of a country estate. The Park of Friendship of Peoples on the embankment of the River Volga in Ulyanovsk (560 miles east of Moscow) will become multi-level. At different levels there will be an amphitheater with a stage, a landscaped garden with rubber surfacing for children, a promenade level by the water and much more. The plan for improving the park by the embankment of the Terek River in Vladikavkaz (1,090 miles south of Moscow) includes not just the reconstruction of pedestrian paths on the embankment and by the Sunni mosque, but also the introduction of cycling lanes and the modernization of the historic tramway route. Following the renovation of historical districts in the center of Volgograd (600 miles south of Moscow), some streets - for example Ostrovsky Street (see photo) - will be pedestrianized. Flowerbeds and cycling lanes will be installed. Read more: Which are the top 10 Russian cities to live in?